In today’s modern business world, it is widely accepted that mentorship relationships can be beneficial, especially in the context of career mobility. Young professionals can benefit from mentorship as a way to elevate their career status and attain high level positions in their company or obtain a second opinion for their career strategy. For entrepreneurs, mentorship can help a company thrive immensely by just having the benefit of vetted experience and advice that a mentor can provide. This advising can be crucial in the startup phase of a business as mentorship advice is an incredible asset to tap into in the preliminary stages of business development. With more and more startups and entrepreneurial activity in today’s modern world, mentorship is as crucial as ever for eager young business owners who are looking to start their own business. However, historically it has been more difficult for women to have accessibility to mentors as opposed to men and this trend has been made clear in a number of ways. Peggy Drexler, a gender and business blogger for Forbes, outlines the current state of female mentorship in her recent article, “Can Women Succeed Without a Mentor?” In her findings, she reports that according to a 2011 McKinsey Report 53% of entry level positions are occupied by female employees but, as the jobs increase in caliber, female representation starkly declines at 37% for mid manager positions and 26% for vice president positions and above. This decline leaves a disproportional ratio of potential mentors to mentees and purports that with fewer women occupying higher level positions, there are fewer women eligible to mentor. Another factor in female mentorship is that women often feel as though they cannot allocate the appropriate time and effort to mentor somebody due to familial time constraints. In fact, a study from the American Psychological Association reported that the female figure that young women wanted to emulate the most were working executives who balanced their professional and family lives. However, this was the group that had the least time to mentor. An additional explanation to the lack of female to female mentorship sources from the problem that mentorship benefits are not being made readily apparent to mentee candidates. According to networking organization Levo League, 95% of millennials have never sought out a mentor. Perhaps this trend stems from the generational attitude towards self-sustainability in the workplace that is commonly associated with the millennial generation or that workplace environments are not making an effort to forge these relationships. According to the 2010-2011 World Economic Forum Report assessing gender diversity in 20 countries, only 59% of companies said they led internal mentoring programs and only 28% of companies had programs specific for women. Even if one of these factors holds truth in a working environment, female mentorship can clearly be difficult to obtain. 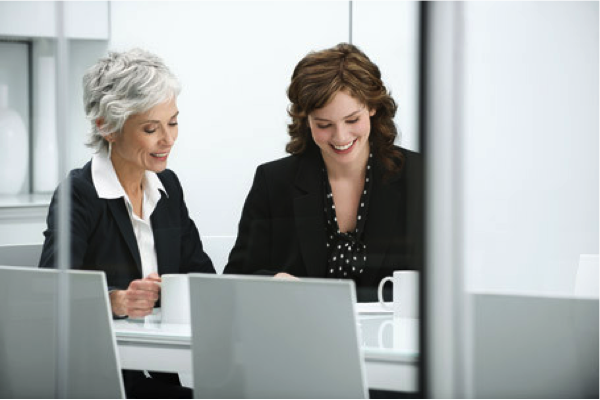 A mentor-mentee relationship can be a mutually beneficial for both participants. Mentees gain the benefit of learning from the mentor’s own processes in their early stages and the lessons and learning opportunities can be extremely impactful for a developing young professional. However, the mentor benefits in a very clear way as well. Mentors are often forced to change their way of managing and teaching to best communicate with their mentee, especially if there is a generational difference. The mentor may become more confident and efficient in working with younger professionals in general and their management skills as an aging professional are given an added dimension of flexibility. Not to mention, working with a mentee opens up a whole new professional network that a mentor can have better access to. Many mentors also see mentorship as a way to give back to the industry they invested their career in and as a way to perpetuate their work ethic and methods into the generations to come. “Choose a mentor you want to be like, not just someone you like. When you choose a mentor, pick someone you wish to emulate. It’s their “know-how” you wish to learn, and you learn more when you respect who’s teaching. This entry was posted in Leadership, Women in Leadership and tagged business, business trends, businesses, company by Annie Wilson. Bookmark the permalink.